BIG BANG IN MALAYSIA WITH A BANG!!!! Big Bang was here!!!!!! The biggest open concert held in Malaysia by K-Pop artist. 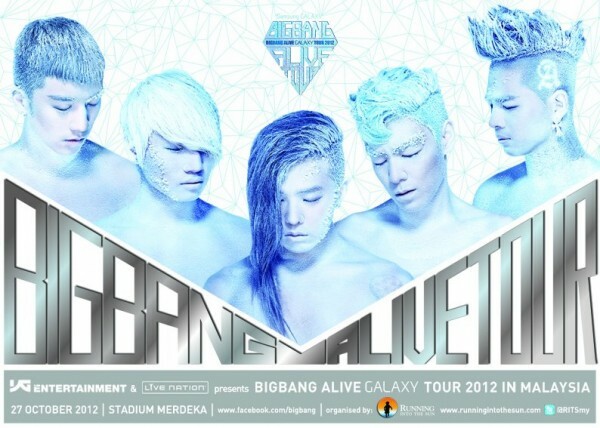 15,000 thousands Big Bang’s fans gathered at Stadium Merdeka on 27th October 2012 to watched this awesome band. Everybody were drenched under heavy rain before the concert start but luckily the rain stop right before the concert started. But hell, nobody moved!!! Me? I’m not VIP (Big Bang fan club), but in the name of appreciating 5 awesome guys’s talent i was among the crowd!!! ya..ya..ya… don’t laugh at me.. :). Me and my buddy Grace arrived around 6.00 pm but the stadium already swarm with sea of fans. Poor management maybe, finding the entrance gate for our CAT 3 ticket already a hassle for us. Fighting to be inside the stadium is another story but Big Bang is living up their status as the best group ever!!! Performing their famous songs for almost 2 hours ..yes, it’s was a short one…Everybody had their fun last weekend and i guess it will remained the most talk concert for a long time. No video or pictures during the show captured by me coz to find a space for my eyes to watch them performing was hard enough. But i’m glad others had and shared. Fancam during their Stupid Liar song’s. I guess this fan was at the same area with me but far nearer to the stage. To whom yet to know who are Big Bang. Busker Busker sing a spring song …and my heart full with cherry blossom!!! My favourite new band!! !